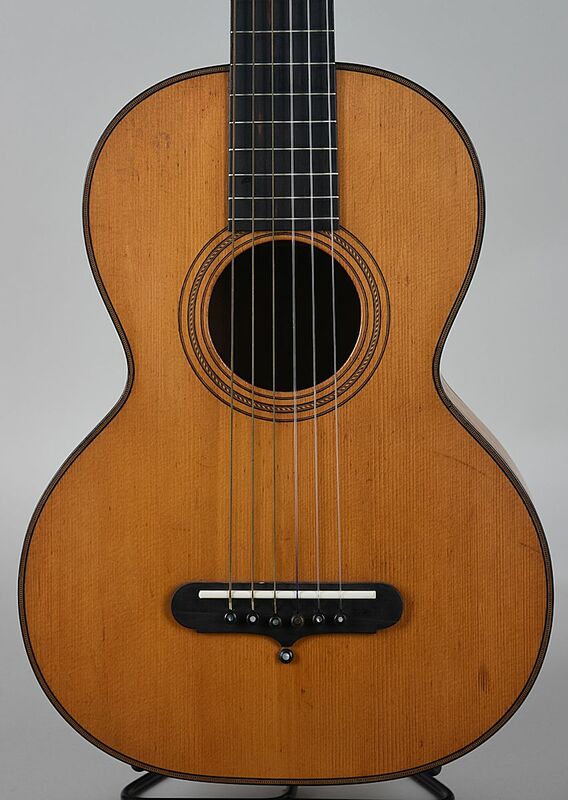 Over the course of a mere fifteen years preceding the outbreak of the Civil War, C. F. Martin Sr., America’s first major guitar maker and the founder of C. F. Martin & Co., transformed the European guitar into a new instrument. The guitar he invented during this remarkably short period of time had all of the design and construction features that would define the iconic American flat-top guitar. Martin emigrated to New York from his native Germany in 1833, where he began crafting elegant guitars based on the model of his Viennese mentor, Johann Georg Stauffer. But within a few years, Martin came under the influence of Spanish guitarists who were all the rage in concert halls, and started to bring Spanish elements into his own guitars. 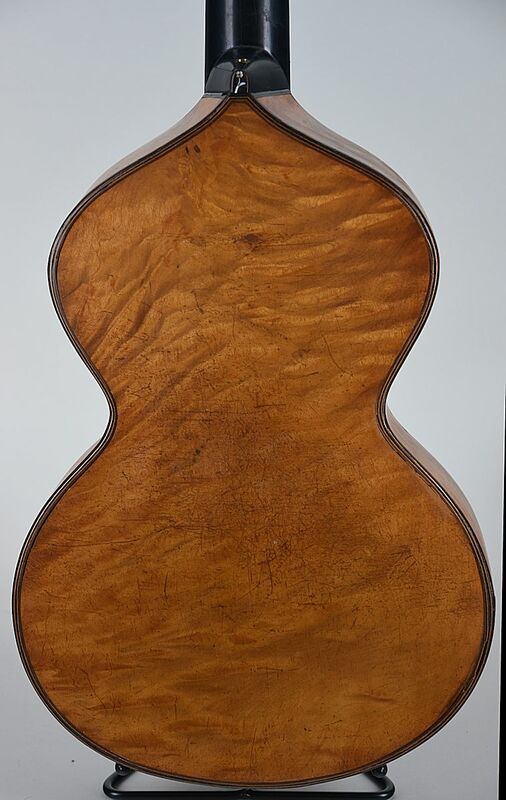 By 1843 Martin had designed the revolutionary X-bracing method of bracing the soundboard of his guitars that set the stage for the emergence of a distinctly American guitar. 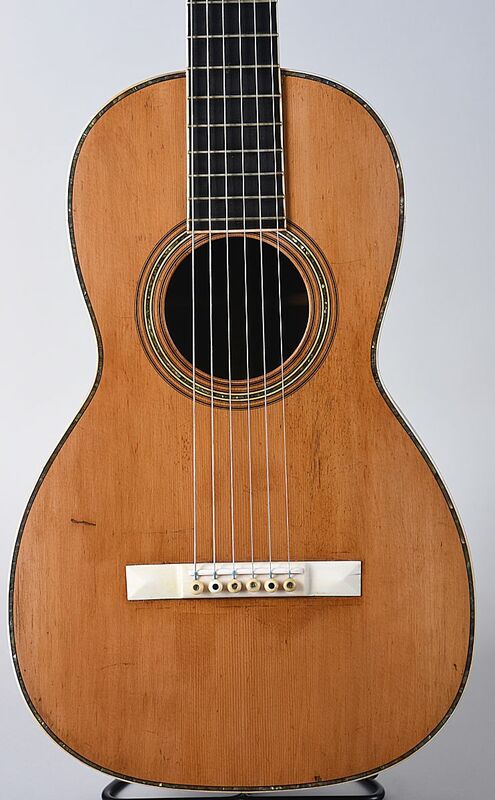 In December of 2017, Vintage Instruments in Philadelphia mounted an exhibit of 35 Martin Guitars made in New York and Nazareth from c.1834 until c.1867, including several of the earliest known C. F. Martin instruments. 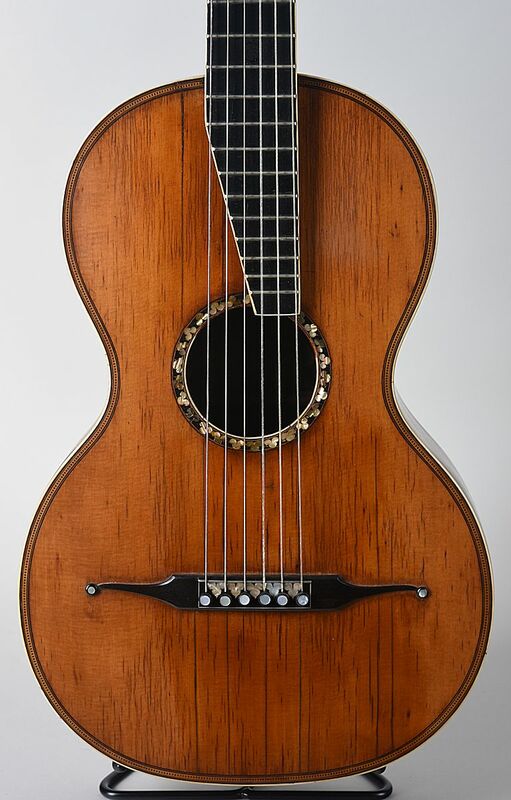 We are now offering for sale a selection of these fine guitars which includes fine examples from each stage of Martin’s development – the original Austro-German Style of guitars he produced upon his arrival in America, his intermediate Spanish Style, and finally the earliest examples of the modern X-braced flat-top guitar. 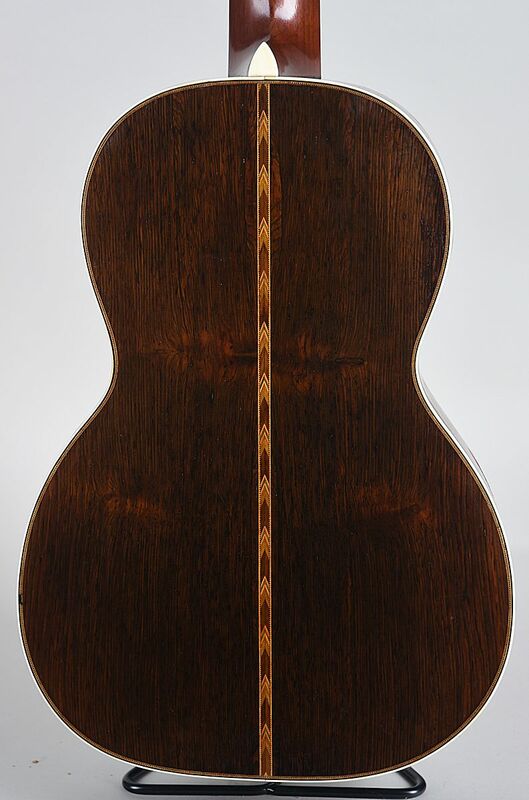 This may be one of the best opportunities to acquire well documented and very scarce early guitars. 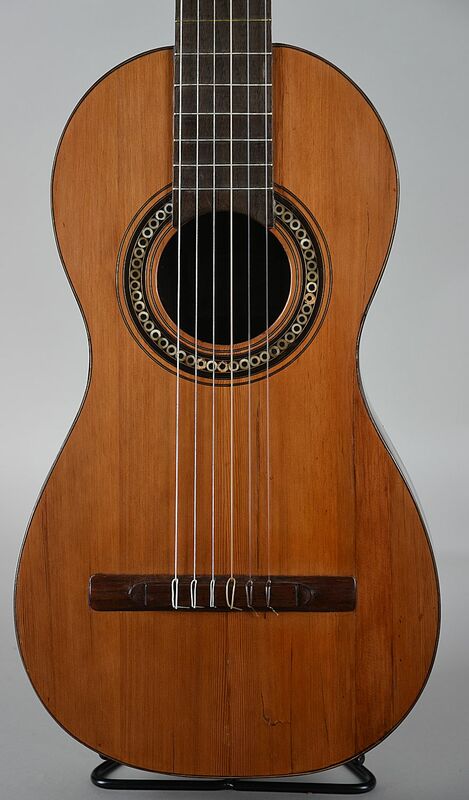 This Spanish guitar by Agustin Caro exhibits the elongated tapered headstock favored by Spanish makers. Additionally, the body is more elongated and deeper than those of contemporary Austro-German makers. While the neck is made of multiple pieces of wood joined together, the sculpted heel design is quite a departure from the cone model. This heel style has become what we now call the “Spanish” heel. The guitar is engineered around 3 fan braces, as well as a straight brace one above the soundhole and another below the soundhole supported on corner blocks. This example of Stauffer’s work survives with its dated label, and is an interesting and unusual combination of Viennese design features and historical ideas. 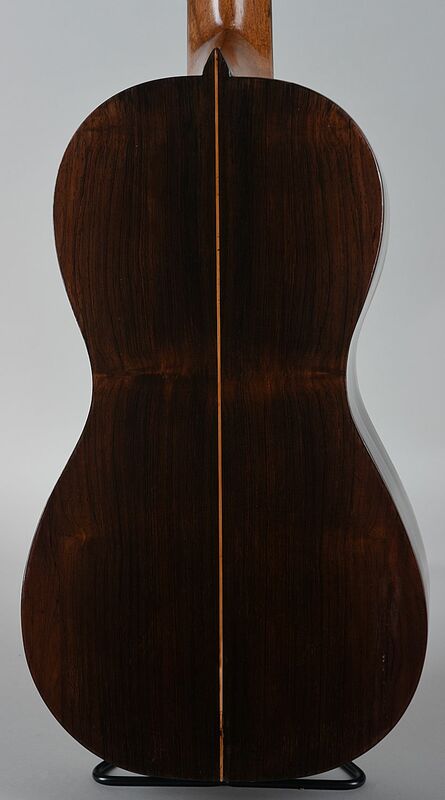 The sloping shoulders of this instrument suggests a relationship with Renaissance guitars, wald zithers and citterns. 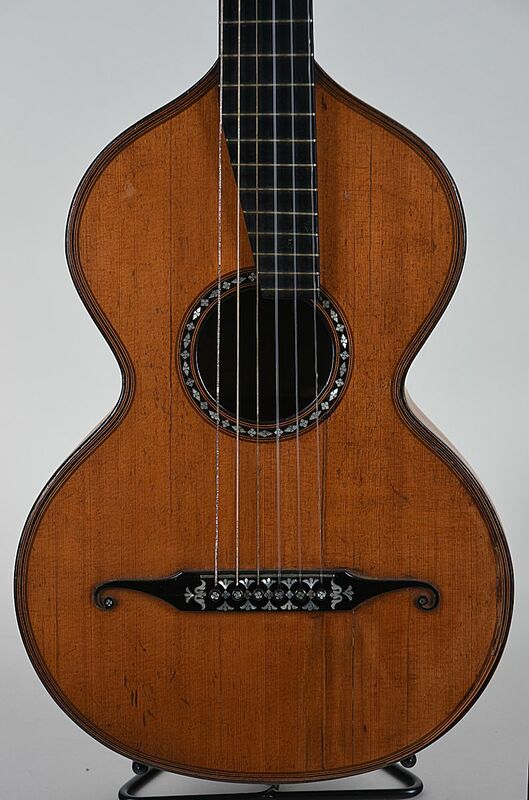 Martin utilized this body style again for some models made later in the 1850s. Stauffer used various headstock designs, including this figure-eight pattern, but he is especially remembered for his flattened scroll headstock shapes. The neck has a cone heel with a clock-key adjustment mechanism, a device used on higher high grade instruments. The pin bridge with a slight central functional section and elongated mustache extension is a Stauffer hallmark. 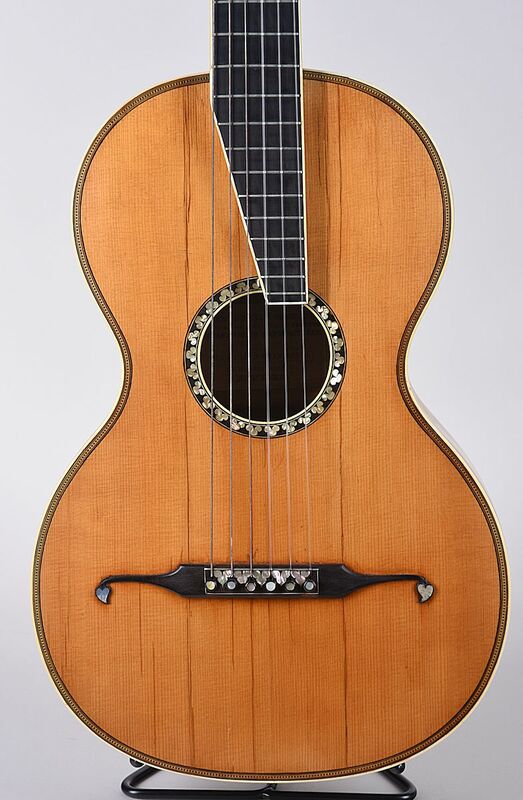 The top bracing is minimal, with one straight brace below the soundhole and one diagonal brace just above the bridge plate. 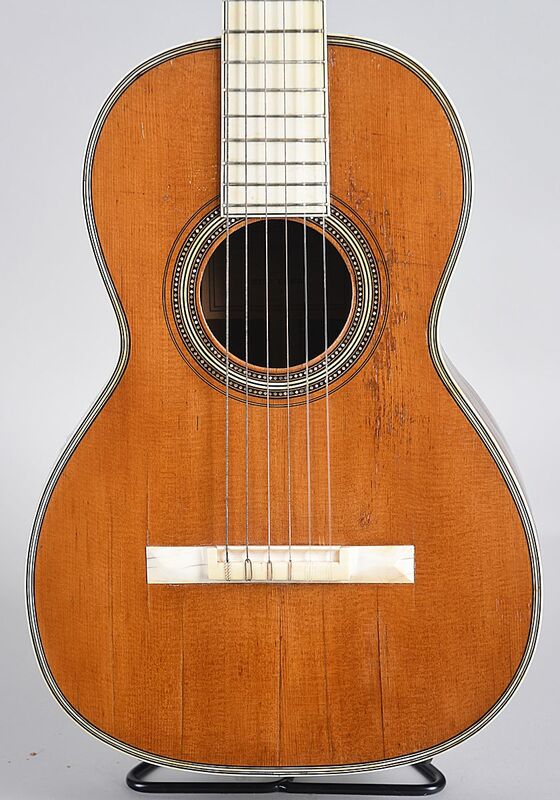 One of the very few extant and well documented C. F. Martin Sr. guitars from his early New York period: 1834-1838. The label of this guitar documents his partnership with Heinrich (Henry) Schatz, another former pupil of Georg Stauffer. The influence of their master is evident here in the Stauffer style scroll with complex and well decorated machine tuners, mustache style pin bridge, and cone heel with adjustment mechanism. 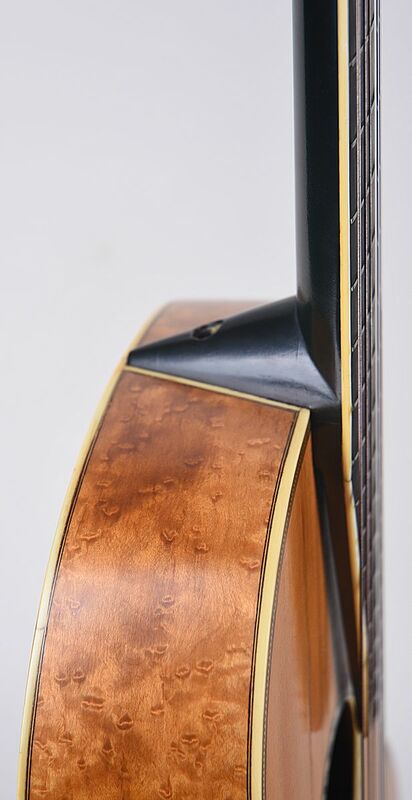 Note the decorative pearl inlays around the soundhole and on the bridge, which are typical of Martin guitars of this period. 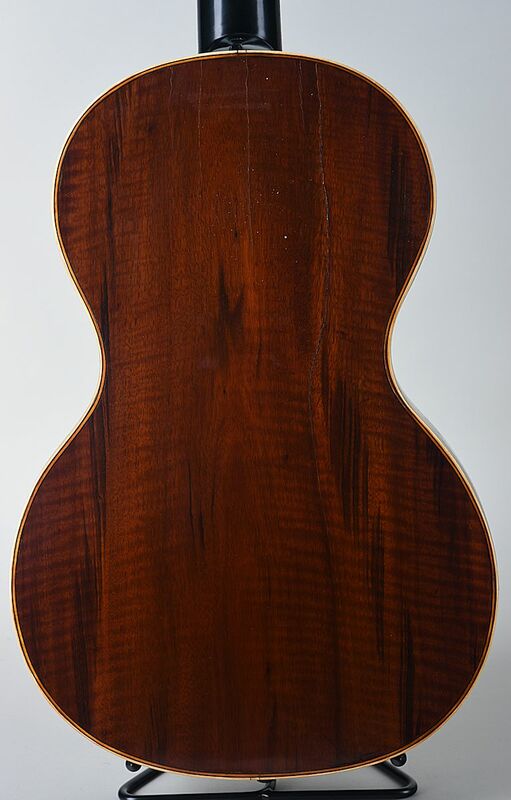 The bracing of this guitar is comprised of one diagonal brace below the bridge plate, one straight brace below the soundhole, and two straight braces above the soundhole. This very fancy custom grade guitar is one of very few documented Martins with an ivory fingerboard, of which there are likely fewer than ten. It was made during the business partnership between C.F. Martin and John Coupa, a teacher who was Martin’s agent in New York City. The ivory tied bridge is a feature inherited from Spanish guitars, but disappeared from Martin’s repertoire by the 1850s. 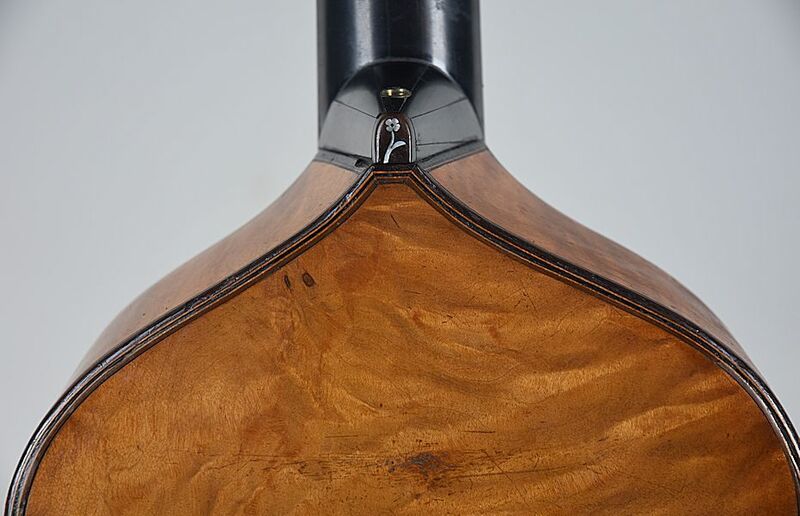 The heel is stepped back from the plane of the back, a departure from Spanish design. 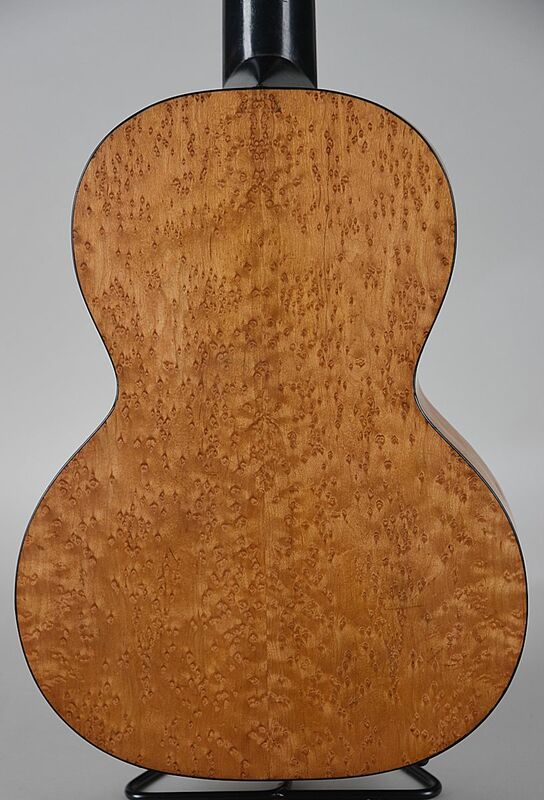 Fancy Terz guitars like this were likely destined for performers and making such as small body have a generous sound would have been a challenge. This Terz has a novel version of X-bracing that was likely a response to this problem. At the same time, this guitar was built with an X-brace, very much an engineering innovation from C.F. Martin. The nickel-silver nut, an idea first implemented in the 1840s, was a luxury feature. Remarkably, family documentation shows us that the original owner of this guitar was Colonel John Darragh Wilkins, who served in the Union Army. C.F. Martin incorporated his business in 1867 with his son and nephew. 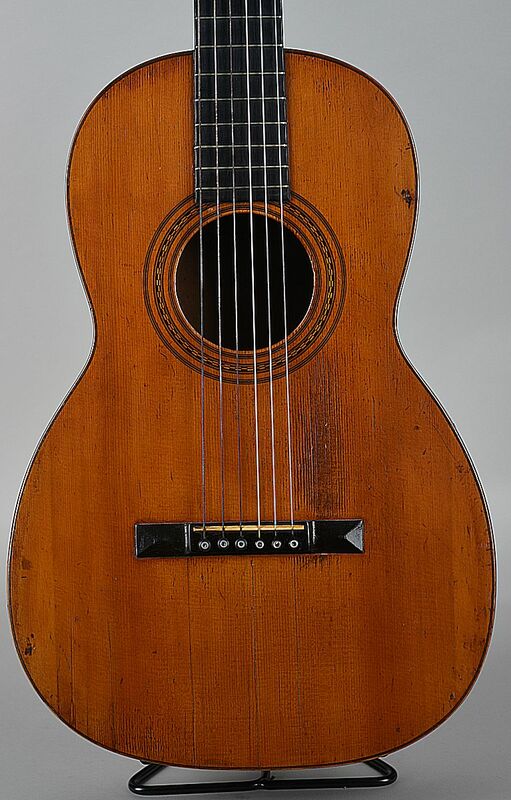 This guitar, made in the Nazareth workshop has both the early C.F. Martin/New York, and C.F. Martin & Co. New York brands. Having passed through decades of work establishing the family in America, the success of the business, and the pattens and engineering of his guitars, this guitar represents the full evolution of C.F. Martin’s distinctive design. This includes the tapered headstock pattern combined with a Spanish heel, X-brace top support, and his own body style. 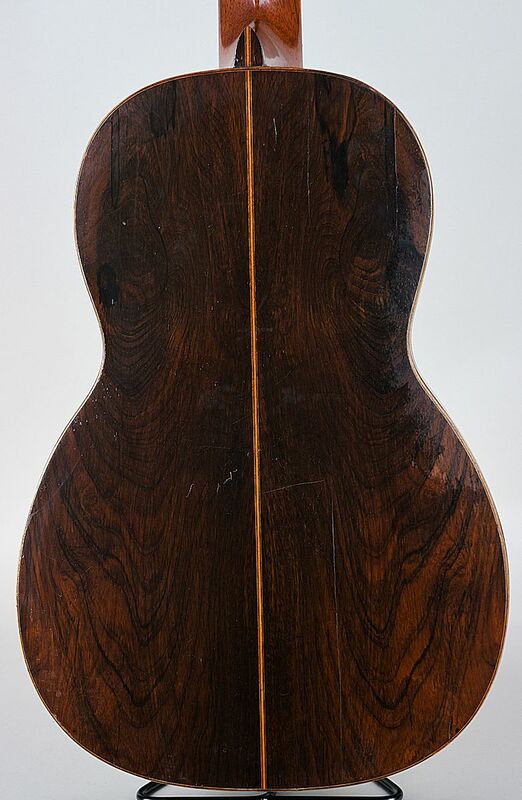 Decorative guitars such as this focus the eye on the high degree of craftsmanship exercised in the Martin workshop, although the same level of work is equally evident in every element of its construction and was the standard for every guitar they made. The Terz guitar model was designed to be tuned a minor third higher than standard guitar tuning, giving guitarists a tenor voice option in an ensemble. 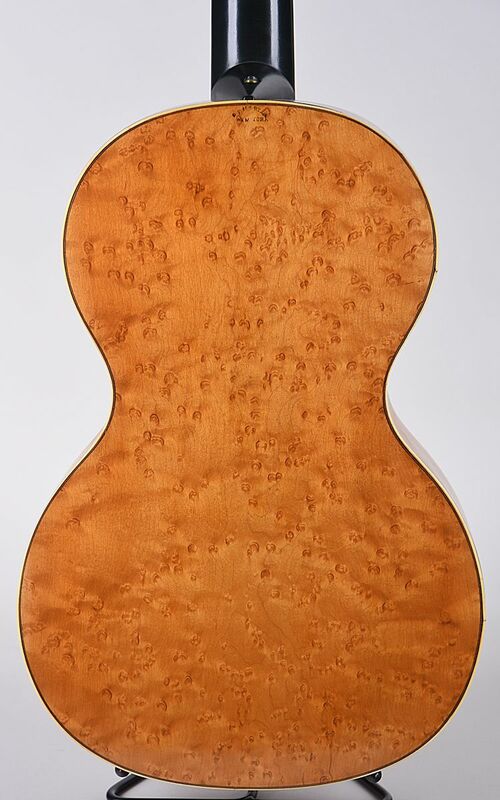 The design of this guitar is clearly influenced by the work of Johann Georg Stauffer. The top is reinforced with three fan braces, a departure from the engineering of Viennese guitars. The back has a traditional birdseye veneer, but it is laid over walnut, a wood that was more easily sourced in America than in Europe. 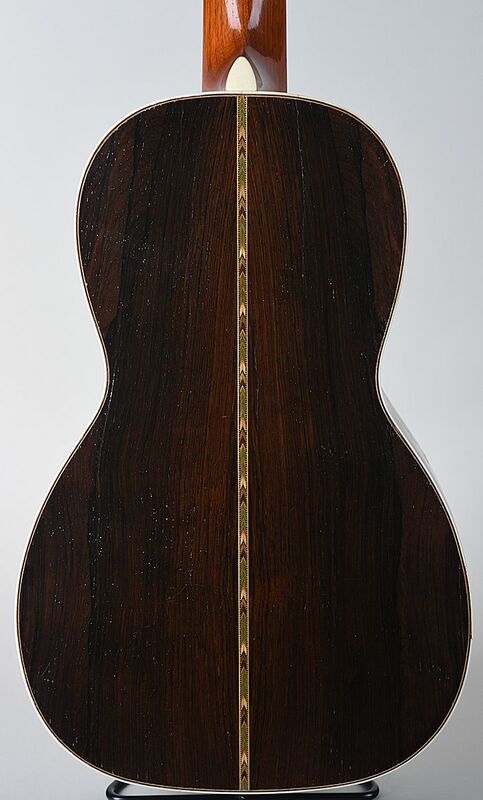 The original shape of the headstock of this guitar was altered to the dome shape you see here. Note the short ebony pin bridge, lacking now the mustache extensions of earlier Austro-German style bridges. The popular size 2 and 2-1/2 guitars came in many variations. This guitar is similar to the 2-1/2-34 also exhibited here. The small differences that made it a grade 40 include the pearl trim around the top. Clearly, as C.F. Martin standardized models, he recognized that consumers preferences for decoration and price necessitated offering a variety of options.